Ever feel like life just threw you a huge curve ball? Whether it’s a call from your husband’s teammate: “Can you come pick him up?” (torn MCL’s and lacerated kidneys, HOLLA) to a child having a serious accident, sometimes life isn’t fair. It’s times like those that The Mullins family jumps to action for a simple home cooked meal in disposable pans, accompanied by treats for both kids and parents. We call it The Care Kit. Our version of The Care Kit includes a baked pasta dish, cookies, a bottle of wine or beer for mom and dad, and flavored milk straws for the kids. I can assemble the baked pasta, cover it with foil, and write the baking instructions in about twenty minutes. My local grocery store has a sweet selection of aluminum foil pans so I keep a few on hand. I don’t lend out my glass bake ware after someone took eight months to return a dish. The point isn’t that we made some big gourmet meal or really wowed anyone. If we were able to relieve just one stress off of some friends, then the mission was accomplished. Boil pasta to al dente per box instructions. While water comes to a boil, combine your pasta sauce and 1 cup of shredded cheese in a bowl large enough to mix in the pasta. Once pasta is cooked, drain in a colander and add to the pasta sauce/cheese mixture. Spread into a 9×13 casserole pan, aluminum foil pan or 2 quart baking dish. Whatever you have or like best. Top with remaining cheese and it’s ready to go! Cover the pan with a lid or foil, and you’re done! Include baking instructions: 350 for 20-30 minutes until heated throughout and top is brown and bubbly. Add Ins are where you can get all fancy but honestly, keeping it simple is okay too. In addition to the baked pasta, we throw in some cookies*. 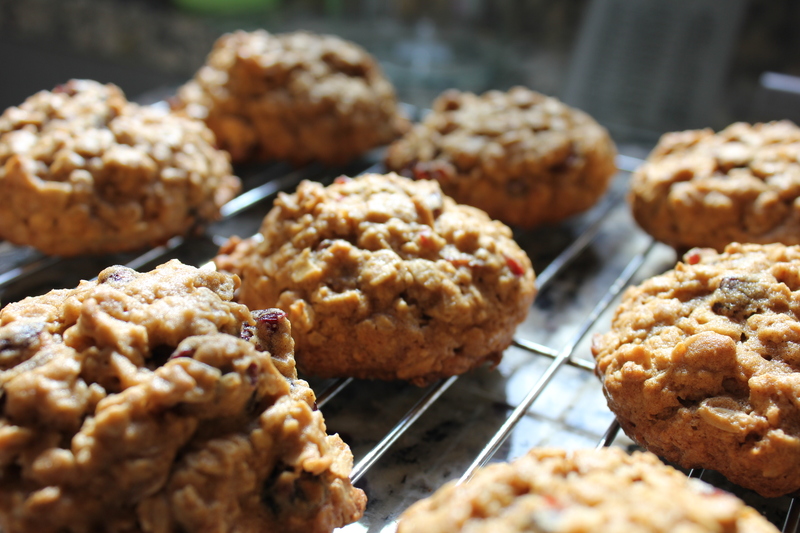 Holly and I make pumpkin cookies filled with oats and dried cranberries. 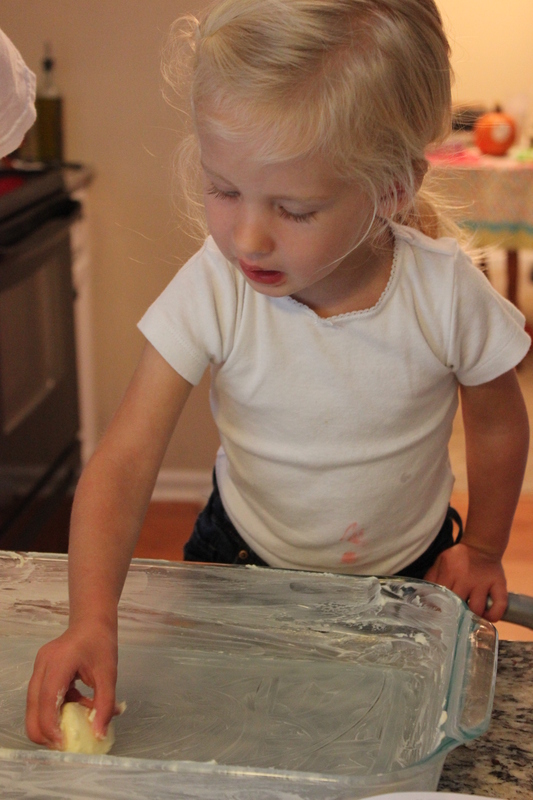 The recipe is out of the Sesame Street Yummy Cookies: Baking With Kids book. It’s a board book full of recipes for healthy and not so healthy cookies featuring Sesame Street characters. The book holds up great to some spilled brown sugar and vanilla extract. Holly can flip through the pages and it stays open on the counter. It’s a cookbook to share with kids to foster a love of cooking. I recommend it. Spending the time with Holly in the kitchen is so special to me and explaining to her this meal isn’t for us is interesting. She picks up on the idea of helping others. I hope these lessons stick. *If we’re on a time crunch and homemade cookies aren’t going to make it into Care Kit, we throw in a few sleeves of Oreos. Your care kit sounds awesome! What a great thing to do for your friends. You’re such an awesome person! As a care kit recipient, I can vouch for what a godsend it is. When you’re stressed out, you don’t need fancy – you just need to feel taken care of. Love it!